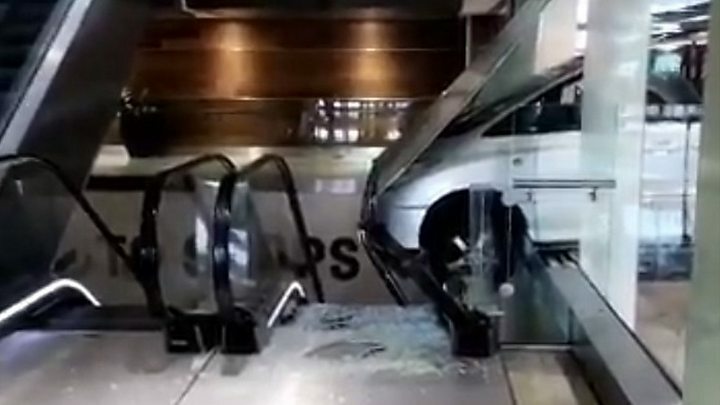 A car has crashed through a glass window and into an escalator at Stratford's Westfield shopping centre. The white people carrier became wedged on top of the moving stairs, having ploughed through glass in the east London shopping centre's car park. Police were called by London Ambulance Service at 14:39 BST and confirmed nobody was injured in the incident. The occupants of the vehicle got out uninjured and the crash was not being treated as suspicious, the Met said. Witness Daniel Iqbal said he thought it looked as though it was an accident and the driver had lost control of the car and put it into the wrong gear.